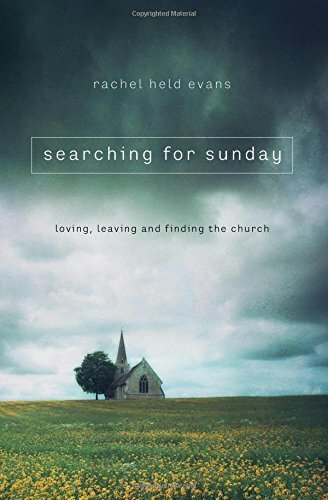 Entertainingly told, with heartfelt entreaties for open-minded churchgoers, Searching for Sunday: loving, leaving, and finding the church by Rachel Held Evans is worth engaging. In an honest, well-written, autobiographical manner, RHE tells of her experience with and in today’s church. Young adults who attended church in the nineties will find familiarity among both her experiences and her doubts – just hopefully not her conclusions. As sincere as her search may be, the traveling of it is plagued with poor logic, allowing emotion to trump exegesis. In the space of three chapters, Evans first declares that “God’s glory resides in the stuff of everyday life, just waiting to be seen”(p.155), and then lists a series of everyday events such as “when a long line at Starbucks miraculously saves them from the fourteen-car pileup on the interstate” that causes her to doubt God and those who believe in Him when such events are attributed to divine providence. As her title states, she is searching, her confusion obvious. Yet, she does search, and that search brings her to call for a unity among believers, a herald welcome and needed. Interestingly, RHE builds her journey around the seven sacraments acknowledged by the Roman Catholic and Eastern Orthodox churches. That these are not usually acknowledged as “sacraments” in the evangelical tradition depicted, RHE never articulates (in fact the Baptist tradition, largest of all the evangelical churches, affirms none at all, calling the two traditionally Protestant sacraments ordinances for theological and practical reasons). She assumes a reader’s familiarity with her arguments for and against church practices, as well as familiarity with the evangelical and liberal churches in which these arguments occur. In doing so she adopts vague argumentation, rarely stating her current opinions. To readers unacquainted with her previous writing (blogs, tweets, and Facebook updates) much of her condemnation toward church practices will feel emotion laden, offering little to no biblical support. Obviously intelligent and knowledgeable of theology, when conclusions of theological significance are made they are based upon stories or situations, uniting RHE’s biblical background with her heart for sinful people. This reads well, proving great in nebulous theory and feel-good application, but lacking biblically or theologically systematic foundations. While this anthology of seeking Sunday raises questions that need to be engaged, it fails to point toward any solidly Biblical or confessional answer. In conclusion, Searching for Sunday is a resource for understanding how the “churched” of today view the evangelical tradition, and what questions many of them are asking. In several ways this book ought to fade from relevance. It is the story of one generation in a single country, and although it does point to a larger church with a larger mission, its essence is limited to a single, specific experience of church.